Planting trees in containers is becoming more popular, especially in landscapes with little or no outside space. You don’t need a large piece of property to grow a tree. If you have a porch, patio, or balcony, you can grow a tree in large container. Container-grown trees can be used to frame entryways or to provide interesting focal points. They are well suited to small spaces in the landscape such as patios and decks and can be used alongside other container-grown plantings as well. Trees can be planted in regular, moveable containers as well as in large, permanent planters. 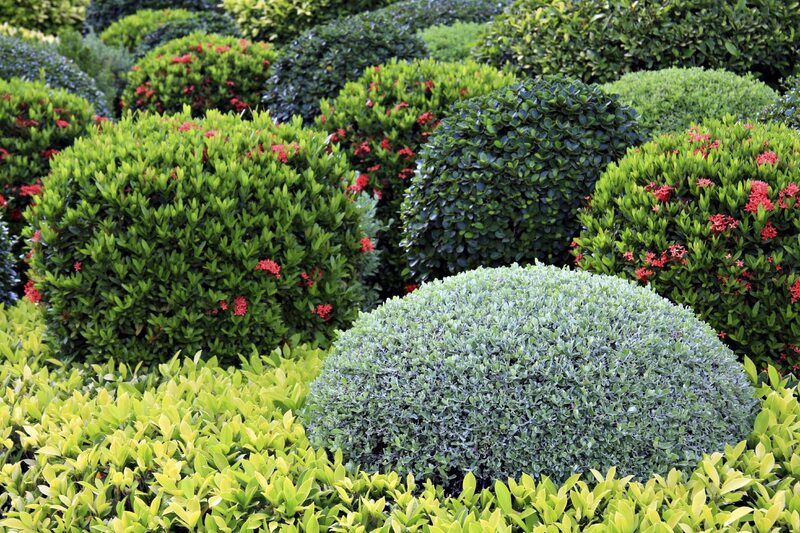 Containers and planters for landscape trees are available in numerous styles, shapes, and colors. Containers should always complement their surroundings as well as the trees that are placed in them. The container should be large enough to accommodate the tree. Therefore, the mature size of the tree should be considered in order to choose a container with adequate space to accommodate both the growing tree and its roots. Containers should also be as wide as they are high in order to provide the best possible insulation to the roots. The overall weight of a container is important too, and this should be taken into consideration as well. Not only is the weight of the container itself a factor, but take into account how much weight the soil, tree, and water will add to it, especially if the container will be used in areas such as balconies or rooftops, where structural weight capacity may be an issue. Clay pots are heavier than plastic, but are more stable in windy conditions, especially with larger trees. Terracotta pots provide weight for stability but should be frost resistant. Lightweight plastic pots are ideal if plants require moving or if they are located on balconies. Larger, heavier containers or planters can be used for trees that will remain as permanent fixtures year round. Drainage is another important factor when choosing a container. Always check the bottoms of containers to ensure that there are ample drainage holes for excess water. Soil is very important to the health of trees. The soil should maintain sufficient aeration and drainage while retaining suitable amounts of moisture. Good container soil retains adequate levels of water without becoming waterlogged. Do not use soil directly from the garden or surrounding landscape. Regular soil may not drain well in containers and could be more prone to weeds, insects, and diseases. Instead, use soil-based compost. This is widely available at nurseries and garden supply centers, or you can make your own using premium potting soil and amending it with compost, sand, and perlite. Caring for a container-grown tree is different from a tree growing in the landscape. They are more prone to drying out; therefore, container-grown trees need regular and thorough watering. Container-grown trees should be supplemented annually with slow-release fertilizer or use a liquid feed at regular intervals. Refresh the soil each spring by removing the loose, dry topsoil and replacing it with fresh, compost-enriched soil. Tree roots in containers may also die during summer if the soil temperature becomes too hot, exceeding air temperatures. The heat from pavement can quickly cause the soil in containers to become excessively hot, burning the roots and drying out the soil. Windy conditions can also dry out container-grown trees. Therefore, containers should be placed in a sheltered location to protect the trees from extreme temperatures and wind. The greatest challenge in selecting trees for containers is in choosing those that are hardy enough to withstand extremes in temperature and can establish roots in a limited amount of soil. Temperature is one of the major determining factors. When trees are in the ground, the soil actually shields them from extremely cold temperatures. Tree roots are less cold hardy than the rest of the tree. As a result, the roots of trees that are planted in containers may die when temperatures drop below freezing. When the soil freezes, the roots cannot absorb water. Choosing a suitable tree for a potted environment varies depending on its overall size, growing requirements, and location. Naturally, if the mature size of a tree falls on the small side, it is better suited for container growing. Smaller species and dwarf varieties are good candidates for containers. Trees that will remain situated in permanent locations should be chosen for their year-round appearance, size, and maintenance requirements. Deciduous trees like Japanese maple, star magnolia, river birch, crepe myrtle, and many types of fruit trees also do well in containers. Trees should also be compatible to their container as well as their surroundings. Since the size of a tree is usually proportional to the size of its root system, containers, in most cases, will restrict its ultimate size. However, if a tree does begin to outgrow its container, there are options. You can prune the roots back and replant it into the same container or transplant it in another location. Root pruning is a similar technique to bonsai and will help to keep the tree small. Remove the tree from its container, tease out and trim the roots, and then repot. Rather than having to resort to the intense task of root pruning, you should consider transplanting the tree to a larger container or if space permits, within the landscape. Tender evergreen or citrus trees should be moved indoors for overwintering. Protect the tree roots from winter cold by keeping the container in a protected area or use an insulating material specifically designed for containers during the coldest months.